For anyone who actually pays attention to what I write on here, you may remember back in December when I wrote about how tattoo artists and clothing are going to be the next result of the tattoo’s mainstream status. Tattoo artist created clothing isn’t exactly barreling down runways in Milan and Paris, but that certainly doesn’t mean that its appeal isn’t growing. Take for example the latest side project of tattoo artists and Miami Ink stars Darren Brass, Chris Garver, Yoji Harada and James Hamilton. For these four talented guys, it’s all about the babies. That’s right, their new line of clothing, Ruthless & Toothless, focuses on “onesies” (those one piece things babies wear, for any of you out there who have no clue what a onesie is). That’s not all though, in addition to the aforementioned onesies, Ruthless & Toothless also sells baby T-shirts, dresses, hoodies and beanies. Everything is small and designed with providing stylish clothes for babies in mind. A quick look through R&T’s first clothing line has me thinking that all of this is well…pretty rad. But wait! What’s this? The R&T guys also plan on selling phone covers for your mobile, something that has been going on in Japan for years and which I’m sure will bode well for Ruthless & Toothless in America. Aside from that, there’s laptop covers, pacifiers, trash cans and a whole bunch of other stuff that isn’t necessarily related to babies but which is very nicely designed indeed. Also, the stuff is made in the USA, so for once, labour isn’t being outsourced to some other country where people are paid like, two cents a month for their work. Although, I can’t vouch for where the clothing itself is made before the main design work is implemented. Still, as far as R&T is concerned, all their stuff is made in the US of A. There you go. Kids are being introduced to tattoo art before they’ve even cut their first tooth. It really says a lot about where tattoo art currently is with regards to the public, as well as where it’s going. Some may think it doesn’t mean anything in the grand scheme of things. 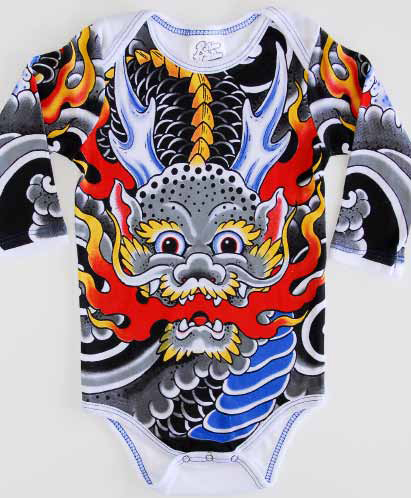 But it’s hard to argue the fact that many people out there will be eagerly throwing down thirty bucks or more just so that their kid can barf all over a onesie designed by one of the best tattoo artists in the world. Believe that.